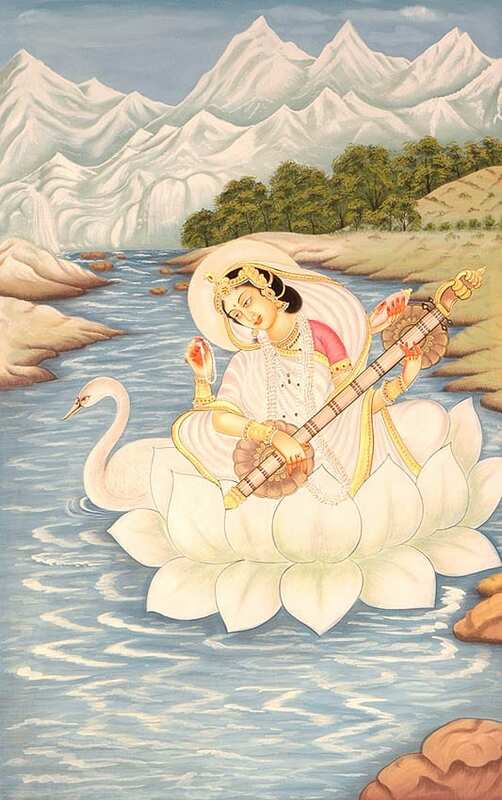 I love the goddess Saraswathi (Saras means “to flow”) whose body is, literally, a river. Beginning in the mountains, she falls and tumbles down to the plains. She widens and deepens. She narrows and becomes shallow. She gurgles and rushes over boulders and pebbles. Wet, fluid, and alive, she is water itself. She nourishes as she moves, bringing new life to all that comes across her way. She carries and cleanses all that is decaying and dying. When I feel her flow through me I am fully present. I am one with what I’m doing, whether it is moving fluidly from one yogasana into another in my salutation to the sun. Or the effortless ease of chopping and sauteing vegetables as I cook a dish that my body needs. Or when I sit down at my piano, listen for, and allow music to emerge from my fingers on the black and white keys. Then, I am Wathi, “she who flows.” I am one with my river. I give up control. I shift from doing to allowing. I allow a deeper wisdom than my rational mind to take over. Tune into yourself. Our instincts and emotions are our guides. When we keep thinking about something we want to do, chances are we’re wanting to grow in that area. Nourish yourself. Go the the beach. Ride your bike. Sit on a park bench with a friend or watch the world around you. Do what feels good and connect with people from whom you receive. Do something different. Are you doing the same thing and expecting the same outcome? Just as the river broadens or narrows, deepens or gets shallow, we need to change our ways of being and how we do things. Laugh, play, and get creative. When we step out of trying to figure things out and into play, it creates and opens space for solutions we haven’t thought of. Let go. Maybe there are past events, relationships, or ways of being that don’t serve you anymore and hold you back. Are there other ways in which you flow? I’d love you to share them here.